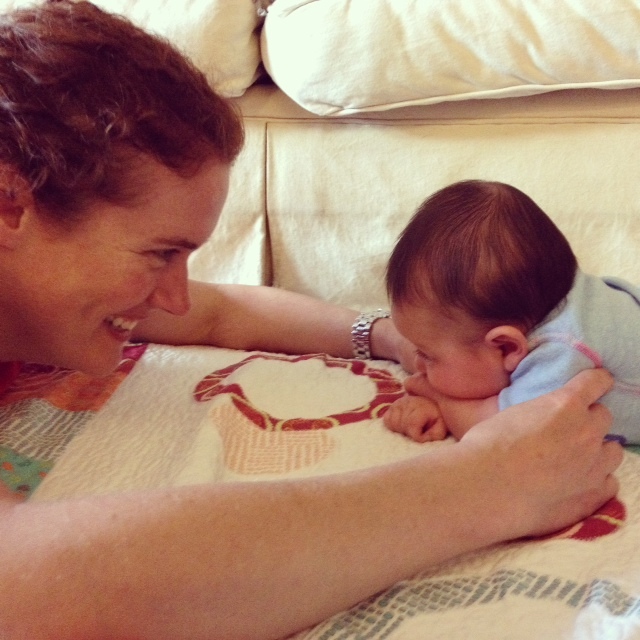 Tummy Time has become a common phrase in the last decade or so as a result of the NICHD Back to Sleep Campaign. Prior to this time most parents put their children to sleep on their stomachs so Tummy Time was never an issue. Now, with children sleeping on their backs they are spending 12 or more hours a day (if a parent is lucky and their child sleeps that much) on their backs which used to be devoted to time on their stomach. And, in my opinion, another factor is the rise of innovative baby equipment that has been produced to make some aspects of parenting easier. I know as a baby sitter I loved having the car seat that clicked into the car and then clicked into the stroller, or even the bouncy seats. As a therapist I now see how all that equipment was taking away from time the child could have been equipment free, exploring their body and environment. I’m not saying get rid of all equipment or put your child to sleep on their stomach, but I think its important to make sure you are balancing things out. For instance, if you went to the gym and lifted weights, and only used your right side, you would be disproportionately strong on one side. This is the same for infants. When they are on their back, they are working the muscles on the front side of their body (abs, neck flexors, hip flexors) and learning how to lift them against gravity so that they are getting stronger. However, the muscles on the back side of their body are getting forgotten about. Those include their back extensors, neck extensors and gluts (tush muscles). The muscles on both sides of their body are important to their gross motor development as they learn new skills and move through the developmental milestones. Stretching – After 9 months in the womb, babies have tight muscles on the front of their body and by being on their stomach they are naturally stretching out so that they can begin to balance out the front and back of their bodies. In addition, the more time they spend in carriers and other pieces of equipment, it keeps them in a slightly flexed position. Decreased chance of developing plagiocephaly – This is when they develop a flat spot on their head. Some babies get it in the back or on the side of their head. This is because the back of their skull is still ‘soft’ and when they have decreased neck strength to move their head, they often lie with their head in one position so it flattens out in that area. When spending time on their belly, the facial muscles are firm and less likely to flatten out/deform. It also gives the back of their head a break from constant contact with a surface. Hip development – When babies are born their femurs (thigh bones) are rotated. Natural development allows a derotation to happen as their gluts get stronger and place a pull on their bones. While on their belly, they are naturally developing their glut strength by activating their trunk and leg muscles against gravity. This promotes the natural development that is supposed to occur! Arm strength – While on their tummy, babies begin to experiment with pushing up on their arms which develops their upper extremity strength as well as eventually leads into rolling over and further exploration of their environment and movement. This is also a precursor to crawling as they learn how to coordinate their arm use. These are just a few of the reasons why I like tummy time. 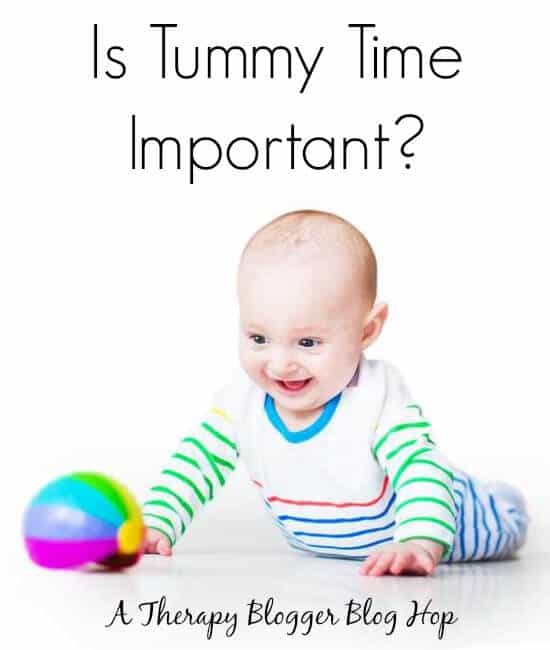 I know it isn’t easy to find time in busy days but I also look at it as ways to get down on the same level as your baby and interact with them. You can even get some good ‘face time’ in! Brilliant article. I completely agree that car seats are necessary, but the spent being inactive needs to be balanced out in some way. I also think getting down on the floor with the baby for lonerg stretches of time is key to getting babies to enjoy tummy time. Thanks! Yes, you can use the information. Thanks for checking, I’m always glad to share.